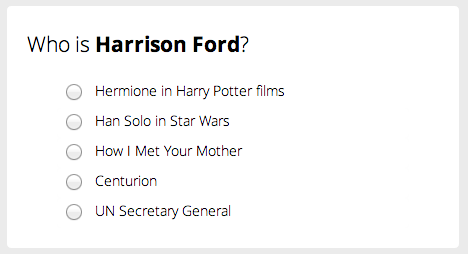 I’ve built a quiz app that tests your knowledge of famous people. I call it PeopleIQ. The interface is quick and fun. 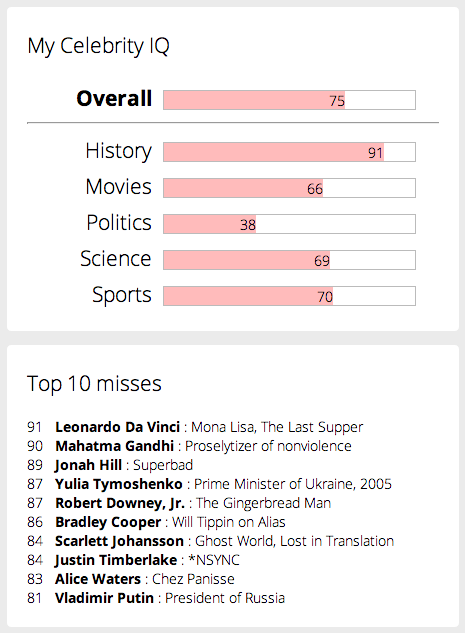 As you play, PeopleIQ will automatically tweak the difficulty of the questions to match your skill level, and generate an accurate celebrity IQ score for you. In addition to big-name celebrities, you can dive into celebrities within specific topics: Science, Sports, Movies, History, Politics, etc. But I need your help to get there! Since this is very first time the site has been launched, PeopleIQ’s smart scoring algorithms don’t know enough to work automatically. In machine learning/data science, this is called a cold start problem. To solve that problem, I need intrepid souls to play the game for about 10 minutes. That’s it. Play for 10 minutes and answer at least 60 questions (more is better!). If you like, the app will invite you to add your email to a mailing list so that I can send you your personal results when they’re ready. Okay, you can stop reading. Do me a favor and go play for 10 minutes! Most of us have a sense of the topics we know best. For example, I'm pretty sure that I'm weak on actors and actresses and pretty much bankrupt on sports. PeopleIQ aims to solve those problems with playful precision. The app will quantify our vague intuitions about our level of knowledge. Precision brings several benefits. First, it enables fair comparisons against other people ("I know more about politics than anyone else in my family!"). Second, if you want to learn more, PeopleIQ will help you zero in on the subjects you should learn about first. ("Here's a list of the 10 most famous baseball players you should add to your mental rolodex.") As you start to make progress, you'll be able to track and celebrate the baby steps, closing big knowledge gaps incrementally, with a minimum of frustration. Reason #2: Do it for Science! How is fame distributed in society? Who are the most famous celebrities today? What is the half-life of fame? What topics tend to cluster together? Are the Beatles really "bigger than Jesus”? There’s some interesting research on these topics, but to the best of my knowledge, it's all based on archival research. I’d argue that the best measure of fame is how many people know who you are and what you've accomplished. Mentions in text ngrams are a proxy for that quantity, but they're not the real thing. At first, we’ll only have data to provide rough answers to these questions. As more people participate (and as I integrate tools for online sample weighting), we’ll be able to converge on more precise estimates. Lest you worry that I’m plotting to pollute the world with spammy Facebook apps, you should know that PeopleIQ isn’t about celebrities so much as people. I have big plans for using the site to create experiences that are more human, more personal, and more genuinely useful. Celebrities are just the first step. If you have ideas for how to improve the site and the experience around it, I’d love to hear them. In the meantime, happy quizzing! Here's that link one more time. Please play!